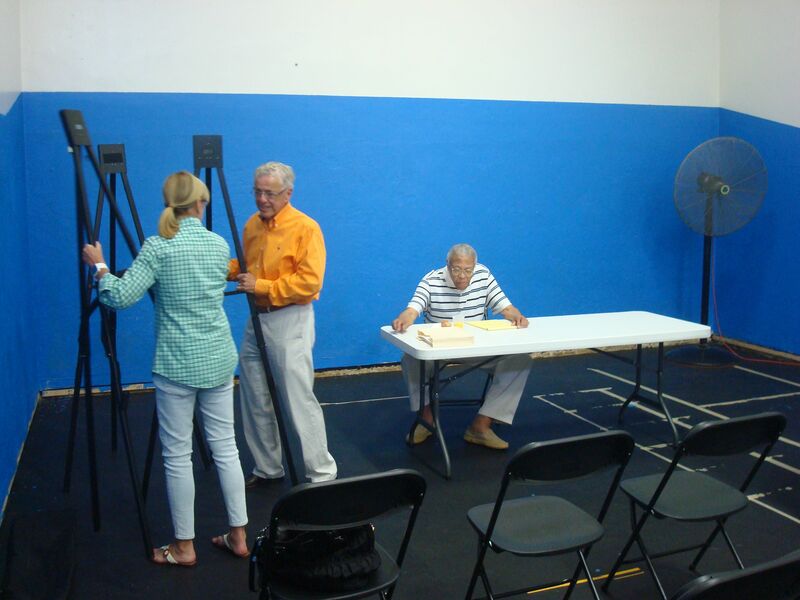 “Welcome, we’re delighted you came to our subterranean spy headquarters,” said former mayor Jim Floyd, welcoming attendees to a meeting of the Witherspoon-Jackson Neighbors group, held Saturday, July 27 in a disused squash court on the lower level of the Princeton YMCA. As fans whirred to try to move the air around the close-packed basement space, Mr Floyd ushered a plethora of speakers before the audience for a brisk-paced agenda. The attendees heard from a trio of Princeton police officers, reporting on the findings of their recent community survey in ‘Sector 5’, which includes the John- Witherspoon area. A plurality of respondents favored ‘community policing’, meaning more officers out on the streets on foot and on bicycles. Mirroring national and local trends that show increased desire for walkability, our local police seem set to spend more of their time getting around without the use of their cars. The meeting also featured presentations from YMCA staff, encouraging participation in their funds drive during a ‘difficult financial situation’, a Princeton University official offering explanation of ongoing construction at the Merwick-Stanworth site, and Jim Firestone, who is spearheading legal efforts to overturn the results of Princeton’s most recent property tax reassessment exercise, which produced an outcome that many neighborhood residents consider unfair. Mr Floyd also found time to inveigh against the recent Princeton Council decision to no longer attempt to add speed humps in Princeton neighborhoods. The highlight of the meeting was a presentation from J. Robert Hillier, who is seeking community input and feedback regarding an ambitious plan he has to reinvent the Witherspoon corridor. Mr Hillier has a long-standing interest in the John-Witherspoon neighborhood. 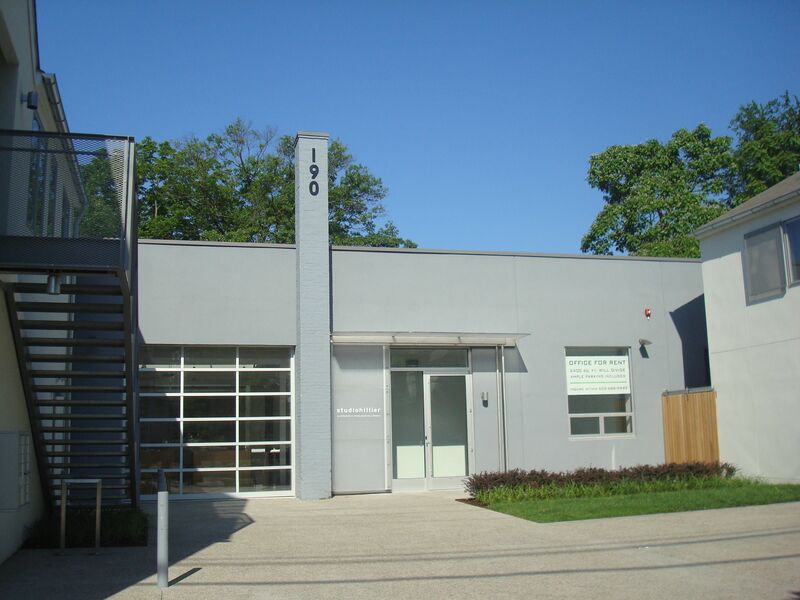 He oversaw refurbishment of a former school for African-American students as ‘The Waxwood Condominium‘, he has redeveloped a property backing onto the neighborhood as a mixed-use site featuring his modern architectural practice (photo below), and he owns several other buildings in the area. Nonetheless, Hillier sees great advantage to redeveloping the Witherspoon corridor adjacent to the neighborhood. He presented a preliminary outline of proposed harmonized zoning along Witherspoon St, to enable mixed uses, with residential units above retail, upgraded community spaces, and improved sidewalk infrastructure. Hillier also pointed out the advantages of density, showing that enabling some flexibility with Princeton’s rigid zoning code would make it dramatically easier for developers like him to provide more affordable housing and increased tax ratables that could offset the high tax rates currently imposed on Princeton homeowners. He ended by urging members of the neighborhood to get in touch to give feedback or gain clarification. Several attendees noted that Hillier’s plans were ‘impressive’ and ‘ambitious’, but there were some questions and critiques. Patricia Fernandez-Kelly quizzed Hillier about what his plan would offer the low-income residents of the neighborhood, whether developers ever really voluntarily provided affordable housing, and whether he could cite any examples of tax ratables filtering down to reduce taxes for area residents. Mr Hillier replied that his plan envisaged 120 sq ft ‘micro-apartments’, which could provide private housing for the area’s workforce at rents radically below what was currently available. Ms Fernandez-Kelly was not convinced that all her questions were answered, however, and area resident Michael Floyd voiced concerns with the plan, stating that he “probably disagreed with about half” of what Mr Hillier had to say. Clearly Mr Hillier’s plan is at a very early stage, with no specifics about exactly what sort of buildings would be included in a final version. But the presentation raises excellent questions about what sort of vision we should have for the Witherspoon corridor, a historic interface area in Princeton, which has been the site of ongoing, frequently controversial redevelopments such as the expansion of the Princeton Arts Council building and the conversion of the former hospital site into the AvalonBay apartments. It is great that a local developer like Mr Hillier, who is genuinely invested in the community, is taking the time to seek feedback on his plans. Do you like Bob Hillier’s previous developments in Princeton? What do you think of his vision for the Witherspoon St corridor? What changes or upgrades to you think are most needed in this part of town? Please leave a comment below! This entry was posted in Affordability, Alternative Transportation, Community, Density, Downtown Vibrancy, Events, People, Princeton, Smart Growth, The Parking Question, Traffic, Zoning and tagged Affordable housing, Hillier, Princeton, Zoning. Bookmark the permalink.